Petit Pains - Julia Child's French Bread Rolls - Happy birthday Julia! These Petit Pains, inspired by Julia Child, are wonderfully crusty and flavorful. These Petit Pains take about 7 hours to make. That does not mean you are active the whole time. It just means that the dough gets lots of extra time to develop flavor. In fact, the dough for these rolls requires very little attention from you. If you need even more time, you can actually slow down the rising time by placing the dough in the refrigerator for each rise. The longer the dough takes to rise, the more developed the flavor. Today would be Julia Child's 105th birthday! It's also the fifth anniversary of the time I tried making her baguettes from Mastering the Art of French Cooking: Volume Two. Just so you know, I was less than successful. Two years later, I tried her Classic French Bread from Baking with Julia. Much better! For her birthday this year, with a tiny bit more confidence, I decided to revisit the original recipe again, this time, making the classic Petit Pains, or "small loaves" from the French Bread recipe. Julia and her co-author, Simone Beck, developed this recipe after much trial and error, and with the help of Raymond Calvel, a renowned Pain Français expert. In fact, the publishing of this recipe, with over 20 pages of instructions and detailed illustrations, was considered groundbreaking at the time. 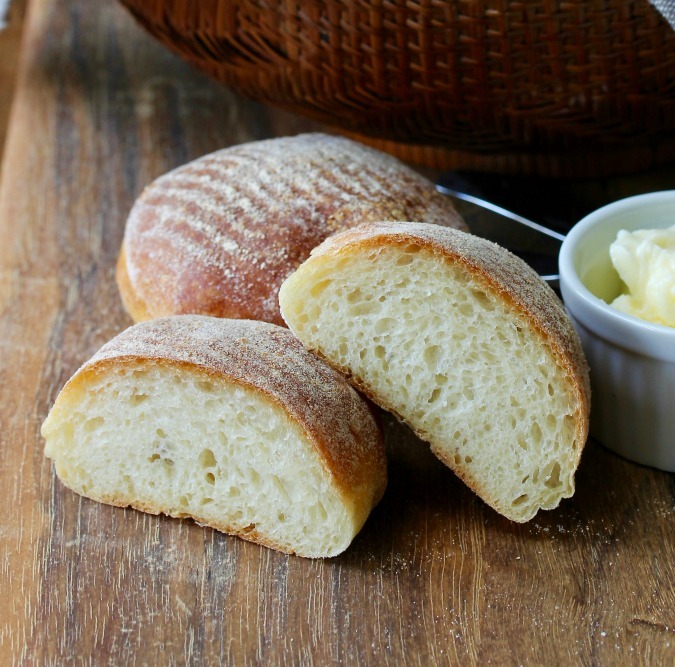 According to Julia, "the average French household does no bread making, and there is no need to because every neighborhood has its own boulangerie serving freshly baked bread every day of the week but one." Think of how difficult it must have been to come up with a recipe for baking French bread at home under these circumstances! The chapter outlines how to recreate a brick oven in your home, how to account for the weather (more on that later), and how to handle sticky dough, all techniques that were later introduced when artisan bread baking at home emerged. I loved these rolls. In fact, Mr. Kitchen and I are pretty much fighting over who gets first dibs on leftovers in the freezer. That being said, this dough, at 82 per cent hydration, still presented a challenge for me. I did find the dough much easier to handle this time, mostly because I have five years' more bread baking experience. The flavor was wonderful even though there is no levain or preferment. The recipe calls for letting the shaped loaves triple in size before baking. There is a very fine line between proofed just enough and over proofing. I decided not to slash these petit pains in case it would deflate them. "We have had the great good fortune of being able to work with Professor R. Calvel, of the École Professionelle de Meunerie... the science of bread making and the teaching of its art are the life work of Professor Calvel..... we think we have developed as professional a system for the home baker as anyone can hope for." This was originally published in 1970, long before the artisan bread movement. Wow. 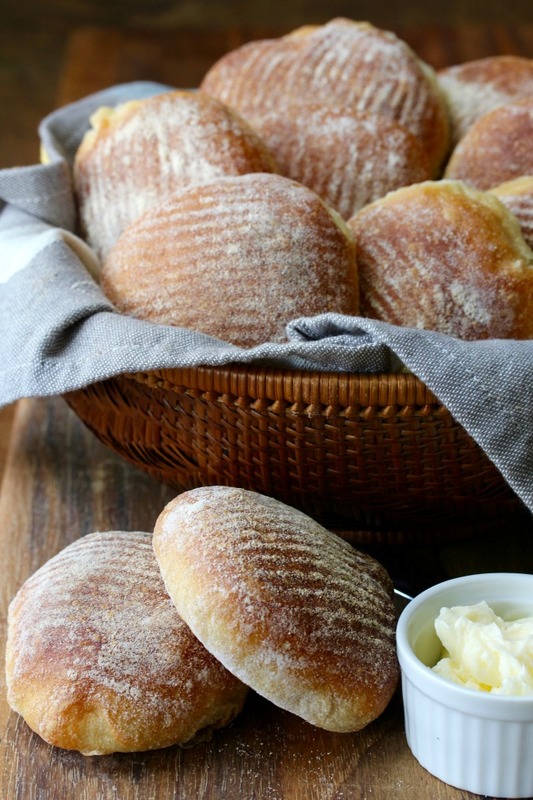 "We... suggest you do not attempt your first bread-making spree in a hot kitchen. When you are used to doughs and know how they should look, smell, and feel, you can adjust your procedures to the weather... pick a dry day and a dry room for your first venture." Julia, your birthday is in August! It's hot up in here! If you are making these rolls in the summer, be sure to let them proof in the coolest room in your house. 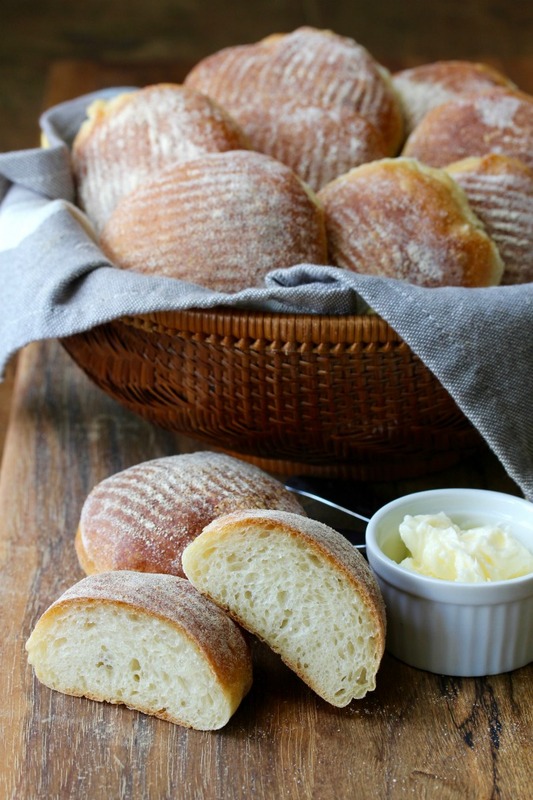 If you notice that your bread dough is getting "sweaty" and damp as it rises, just lightly sprinkle it with some flour. Here's dear Julia making this bread! After the recipe, be sure to check out more Julia Child inspired recipes in honor of her birthday. P.S. The pattern on top of these petit pains is from a dish towel my sister Katie gave me from Bouchon Bakery in Yountville, California. I love the pattern it makes on the bread. Combine the yeast and the warm water in a small bowl and let sit until the yeast has dissolved, about 5 minutes. Add the flour, salt, the rest of the water, and the remaining yeast mixture to the bowl of a stand mixer and mix with the dough hook for about 2 minutes on low. Turn the dough out onto your bench or work surface and let it rest for about 3 minutes. Wash and dry the bowl. Knead the dough by hand by lifting the dough and flipping it over onto itself. Scrape the dough off of the work surface with a bench scraper and slap it down again. Using a wet hand and a dough scraper continue to lift and slap the dough until the gluten develops (meaning the dough is hard to stretch and develops tension) for about 5 to 10 minutes. Put the dough back into the stand mixer, and knead on low for about 7 minutes. Let the dough rest for about 4 minutes. Form the dough into a ball and place it into an oiled bowl or dough rising bucket, cover with plastic wrap, and let rise until tripled, about 3 to 4 hours. The environment should be around 70 degrees F.
Scrape the dough out of the bowl onto a lightly floured surface and lightly press it down with your fingertips. If the dough is damp and "sweaty," sprinkle it lightly with flour. Pinch any bubbles with your fingers to deflate. With floured hands, form the dough into a ball, folding it over itself, and place it back into the bowl/bucket. Cover and let rise again until not quite tripled, about 1 1/2 to 2 hours. Turn the dough out onto a lightly floured surface. If it seems damp, lightly flour the surface. With a bench knife, cut the dough into 12 equal pieces. Fold each piece in two. Cover all of the pieces with oiled plastic wrap and let rest for 5 minutes. Prepare two dish towels by rubbing them generously with a 50/50 mixture of wheat flour and rice flour. Pleat the towels to form 3 inch by 3 inch cavities in which the rolls will rise. Each dish towel should be able to accommodate 6 rolls. Form each small piece of dough as if you were forming a tiny boule. Gather up all of the "sides" of the dough to the middle, turn the dough over, and then slide with your hands on the work surface to develop tension. Roll it under the palm of your hand and push the edges of the dough underneath to form a pucker/seam. Place the roll, pucker/seam side up, into one of the cavities of the prepared dish towel. Cover with oiled plastic wrap. Repeat with the remaining dough pieces. Let rise for about 1 1/2 to 2 hours until almost tripled in volume. Preheat the oven to 450 degrees F with a baking stone on the center rack and a steam pan on the bottom rack. Bring one cup of water to a boil. Line a baking sheet with parchment paper. Stretch out the dish towel to separate the rolls. Using a floured hand and floured scraper, gently lift the rolls from the dish towel and place each, seam side down, onto the baking sheet. Place the boiling water into the steam pan and then slide the baking sheet onto the baking stone. Immediately shut the oven door. Bake the rolls for about 25 minutes, until golden. These rolls are wonderful served immediately. They can also be cooled on a wire rack to be served the same day. Leftovers should be individually wrapped and frozen. More recipes in honor of Julia! These rolls look amazing! I wish we had these to go with the Coq au Vin the other night. I'm impressed you made French rolls/bread. Like most of the French I tend to buy bread at my favorite bakery. What a great event - It's such fun to try Julia's recipes and celebrate her, isn't it? It is a great event! That would have been the perfect combo with your coq au vin, which I intend to try asap! You always make the best looking bread, Karen! Thanks for sharing this recipe for Julia Child's birthday. I can't wait to try it. Thanks so much Camilla. You put a big smile on my face! There is something wonderful about making bread. I think the kneading is so zen like. I will have to try making these. I don't mind if it takes 7 hours to make as long as they come out as good as yours! Thank you Cynthia! Bread baking is like therapy for me. Your rolls look amazing! Absolutely gorgeous! I enjoy making bread, but I have never made any like these! I can't wait to try the recipe! I hope they look half as good as yours! They look absolutely perfect Karen. Julia is smiling down at you with pride. but you did such a great job, absolutely wonderful bake - and post! Oh thank you so much. It's been five years since I've blogged on her birthday, and it's so fun to read her recipes and revisit her videos. I love her style so much. I will try these with sourdough! they look great. Oh how cool! Do let me know how it turns out! Oh my gosh - I love everything about this recipe! Well done! These look beautiful, Karen. I suddenly have an urge to rush out to get Gruyere, tomato and ham (I already have the butter) to make the best sandwiches in the world. These buns must be soooooooo good!! We'd love to use them with Greek salad, to soak up the juices and the flavorful extra virgin olive oil. M-m-mmm! 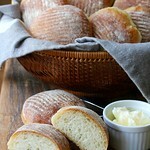 Thank you for sharing the recipe as well as ALL the fantastic info about Julia Child and bread making! You're awesome! You are too sweet! These would be perfect soaking up olive oil, which I did! Just finished listening to Julia's My Life In Paris. What a woman! Right? She was such a pioneer, and so accessible too.